Do Not Cry for What You Do Not Have/ No Llores por Lo Que No Tienes. In the U.S. we hear stories of people who immigrated to the U.S. and through hard work have been able to settle, not only making a living for themselves, but also helping their families in the places of origin. 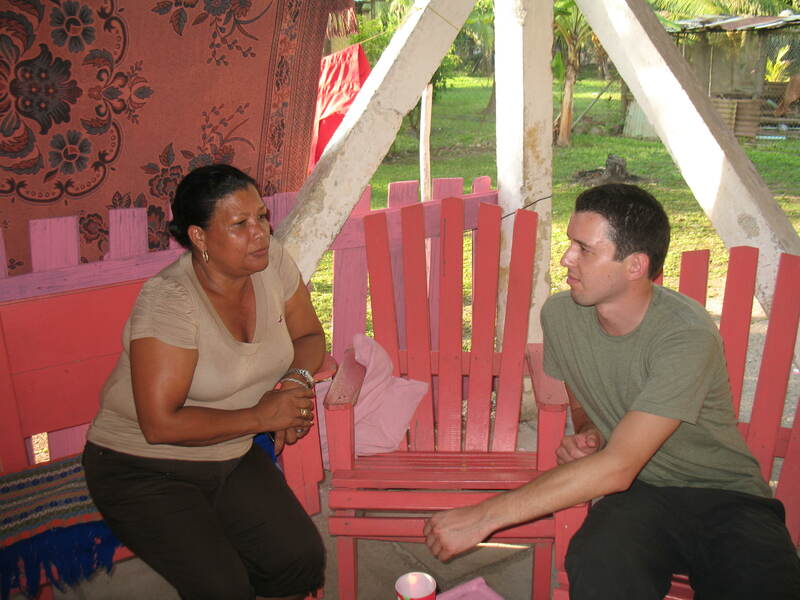 These past days in Honduras we have also heard “failed” experiences, stories of people who have been deported and are struggling to make amends in their places of origin. However, there are other stories that easily could be overlooked, the stories of those who in the attempt to find better life up North, suffer serious injuries in which they have lost one or several extremities. The journey to the U.S. is extremely hard, very often inhumane. 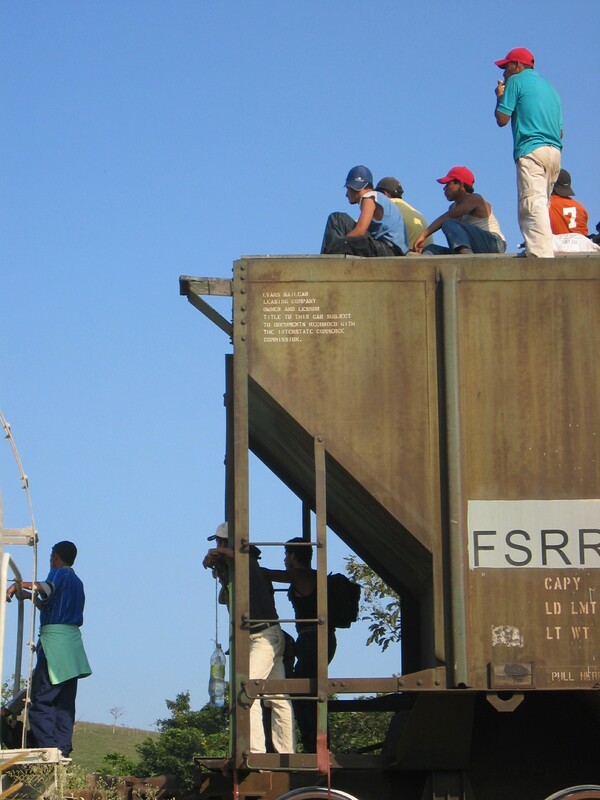 Some “economic migrants,” lacking financial means, have to ride on top of cargo trains with no security at all. The train reaches high speeds, with occasional sudden stops, easily causing people to fall. Sometimes, these falls are fatal. Other times, they injure people so badly that it takes years to recover. Meanwhile, their dreams of providing a better life for their families disappear. This is the case of Jose Luis Hernandez. On the train up North, he suffered a terrible accident, losing one leg, one arm, and four of the fingers from his remaining arm. 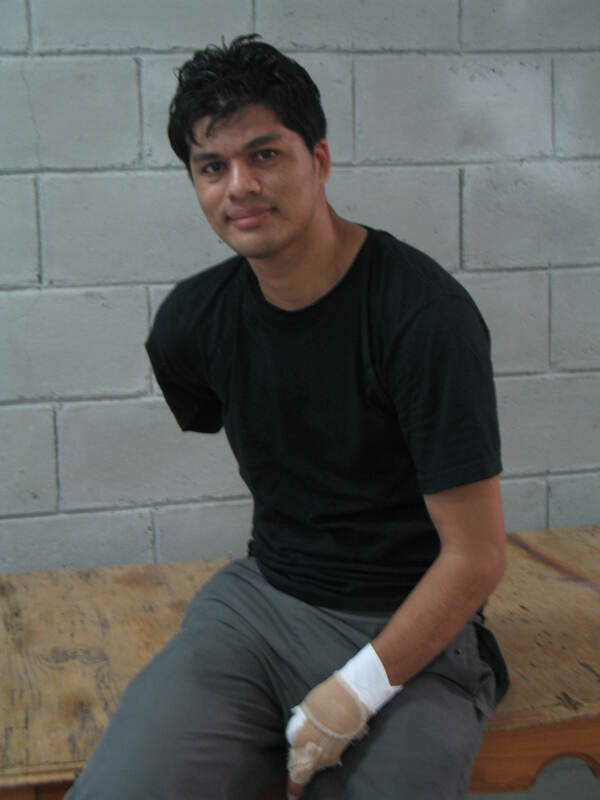 It has taken him years to recover, not only from the physical wounds, but also from the emotional wounds: the stigma of now being disabled, the shame of returning home with nothing, the sense of being a burden for his family. 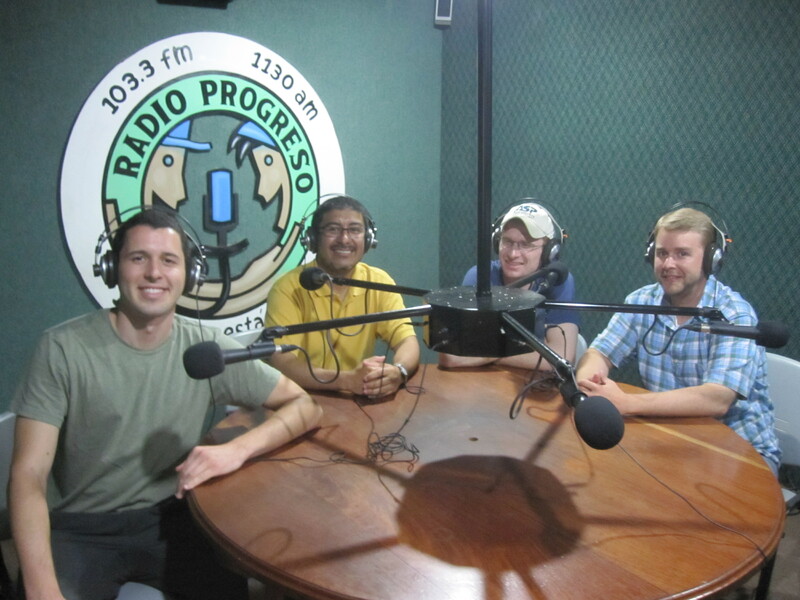 Through hard work, determination, and the support of other organizations in Honduras like ERIC (Reflection, Research, and communication Team –a Jesuit apostolate) and COFAMIDE (Committee of Families of Disappeared Migrants), he has gathered other people who have suffered a similar fate. Together, they now form COMIRED (Committee of Returned and Disabled Migrants). 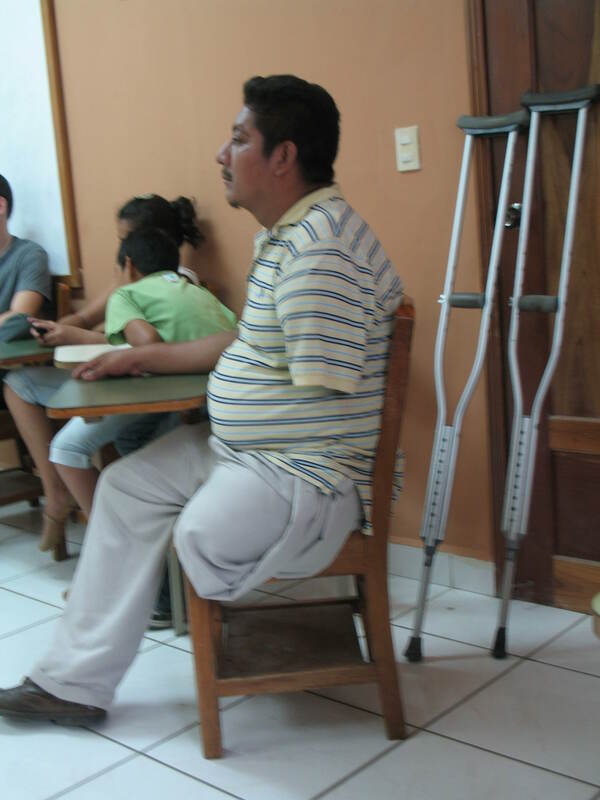 This organization has at least 26 members in Honduras, who fight for government support of those returning migrants with special needs (jobs, prosthesis, wheelchairs, etc.). Thus far, the governmental response and support has been very little, and the challenges are many. Nonetheless, Jose Luis says that “it is better not to cry for what we do not have, but to fight for what we want.” That’s what he is trying to do with COMIRED. En los Estados Unidos escuchamos historias de gente que migró hacia el norte y que trabajando duro lograron establecerse y apoyar a sus familias en sus lugares de origen. Pero, durante estos días en Honduras nosotros también hemos escuchado historias de fracaso. Historias de gente que ha sido deportada y sufren para rehacer su vida nuevamente. Sin embargo, hay otras historias que fácilmente pueden pasarse por alto, las historias de aquellos que en su intento de encontrar una vida mejor en el norte, sufrieron serios accidentes en los que perdieron alguna o varias extremidades. La ruta a los Estados Unidos es extremadamente dura, inhumana. Algunos “migrantes económicos,” careciendo de medios tienen que viajar encima de vagones de trenes de carga sin ningun tipo de seguridad. Los trenes alcanzan altas velocidades y en ocasiones se detienen suvitamente causando que la gente caiga de los trenes. En ocasiones estas caidas son fatales y otras veces, la gente queda tan mal herida que toma años recuperarse. Mientras tanto, sus sueños de proveer una major vida para sus familias desaparece. Este es el caso de José Luis Hernández. Viajando en el tren, el sufrió un terrible accidente, perdiendo una pierna, un brazo y cuatro dedos de su otra mano. Le ha tomado años recuperarse, no sólo de las heridas físicas, sino también de las heridas emocionales: el estigma de ser ahora discapacitado, la vergüenza de haber regresado fracasado y sin nada y la pena de sentirse una carga para su familia. A través de trabajo duro, determinación y el apoyo de otras organizaciones Hondureñas, como el ERIC (Equipo de Reflexion y Comunicación –un apostolado de la Compañía) y COFAMIDE (Comité de Familias de Migrantes Desaparecidos), él ha reunido a más gente que ha corrido su misma suerte. Juntos, ellos han formado el COMIRED (Comité de Migrantes Retornados Discapacitados). Esta organización que tiene al menos 26 miembros en Honduras, lucha por obtener apoyo del gobierno para aquellos retornados con necesidades especiales como trabajos para discapacitados, prótesis, sillas de ruedas, etcétera. Hasta este momento, el apoyo del gobierno ha sido mínimo y los retos son muchos. Sin embargo, José Luis dice que “no debemos llorar por lo que no tenemos, sino luchar por lo que queremos.“ Eso es lo que él está tratando de hacer con COMIRED. On Friday we visited a community in the Honduran countryside, about 30 minutes outside of El Progreso. There we met with families who have been tragically affected in some way by migration. We were privileged to listen to their stories. Here are two of them. Victoria told us her story through grief and tears. 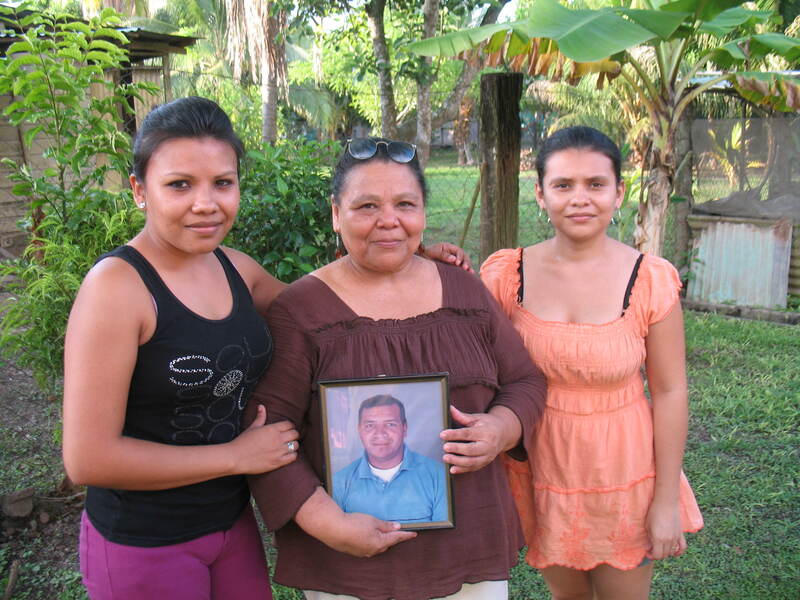 Her husband is counted among the desaparecidos, those migrants who are never heard from again after beginning the long, dangerous journey to the States. Victoria recounted how her husband left their home in order to provide a better life for their daughters. She has not heard from him in eight years and clings desperately to the hope that she will find out what happened to him. We also heard the story of Meli, whose sons passed through the migrant route thirteen years ago. They survived the journey and currently reside in the States, but Meli laments the fact that she has not been able to see them since their departure. It is very difficult for Meli to obtain a Visa in order to visit them, and her sons cannot leave the US if they want to stay there. Meli described this pain of separation as a void in her heart. While she is grateful that her sons are alive in the US, she also experiences a deep sadness because her family is divided. She cannot be with those whom she loves. Those who migrate do not choose to uproot themselves and move to the States on some whim. They migrate because they have no other alternative if they are going to live a better life. They migrate to escape poverty, violence, hunger, and unemployment. But in doing so they are forced to be separated from their loved ones, and this is a source of great suffering. We must keep this in mind whenever we think of the migrant situation. The migrant is not some illegal foreigner. He or she is a person who is loved by another, a person for whom someone’s heart aches. We are grateful that Victoria and Meli opened up their hearts to us and shared their stories. We take these stories with us as we continue our journey. El viernes visitamos una comunidad en el área rural de Honduras, 30 minutos a las afueras de El Progreso. Ahí conocimos familias que han sido afectadas trágicamente por la migración y fuimos privilegiados al escuchar sus historias. Aquí tenemos dos de ellas. Victoria compartió su historia entre lágrimas y dolor. Su esposo se encuentra entre los muchos migrantes desaparecidos, aquellos de los cuáles nunca se volvió a escuchar nada después de haber iniciado la larga y peligrosa jornada a los Estados Unidos. Victoria narró como su esposo dejó el hogar porque deseaba ofrecer algo mejor a sus hijas. Ella no ha vuelto a escuchar de él en ocho años y aún se aferra desesperadamente a la esperanza de saber que fue lo que le sucedió. 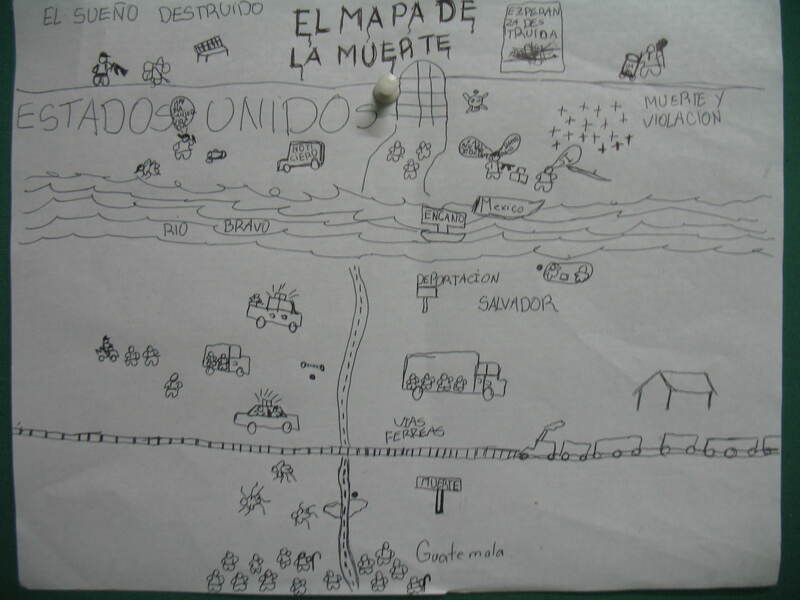 También escuchamos la historia de Meli, cuyos hijos tomaron la ruta migratoria hace 13 años. Ellos sobrevivieron la jornada y actualmente residen en los Estados Unidos, pero Meli lamenta el hecho de que no ha vuelto a verlos desde que partieron. Es muy difícil para Meli obtener una visa para visitarlos y sus hijos no pueden dejar el norte si quieren permanecer allá. Meli describe el dolor de la separación como “un hueco en el corazón.” A pesar de estar agradecida de las oportunidades que tienen sus hijos en los Estados Unidos, ella también vive con una profunda tristeza porque su familia está dividida, porque no puede estar con los que ella ama. Aquellos que migran no eligen caprichosa o repentinamente migrar a los Estados Unidos. Ellos emigran porque no tiene otra alternativa para vivir una vida mejor. Ellos emigran para escapar de la pobreza, la violencia, el hambre y la falta de oportunidades. Al hacerlo se ven forzados a separarse de las familias que aman y parta todos los implicados es fuente de gran sufrimiento. Debemos tener en cuenta, al pensar en la migración, que el inmigrante no es un extranjero ilegal. Ella o él es una persona que es amad@ por otr@s, una persona por quién el corazón de otr@s se duele. Estamos agradecidos que Victoria y Meli nos abrieron sus corazones para compartir sus historias. Nos llevamos estas historias al continuar nuestra jornada. “Looking at a bus of tears”–this was the expression a Jesuit used to describe the deportation of undocumented migrants from the southern U.S. border. The experience was heartbreaking. The faces of the migrants reflected their frustration after a long, harsh journey up North. Migration cannot simply be reduced to those moments when persons leave their native lands, transit thorough other countries, or arrive at new destinations. There is also the moment, as we saw it on Thursday, when migrants return to their countries after being deported. Some of these “deportees” had only just crossed the border. Others, however, had made new lives for themselves, settling in the States for some 8 to 16 years. Not only had they managed to raise and support their own families. They had also contributed to the U.S. economy along the way. Sadly, these lives vanished like smoke when the “flight of crushed dreams” arrived here on Thursday. The plane, traveling from Arizona to San Pedro Sula, Honduras, returned a group of 116 Hondurans, a number which included eight women. 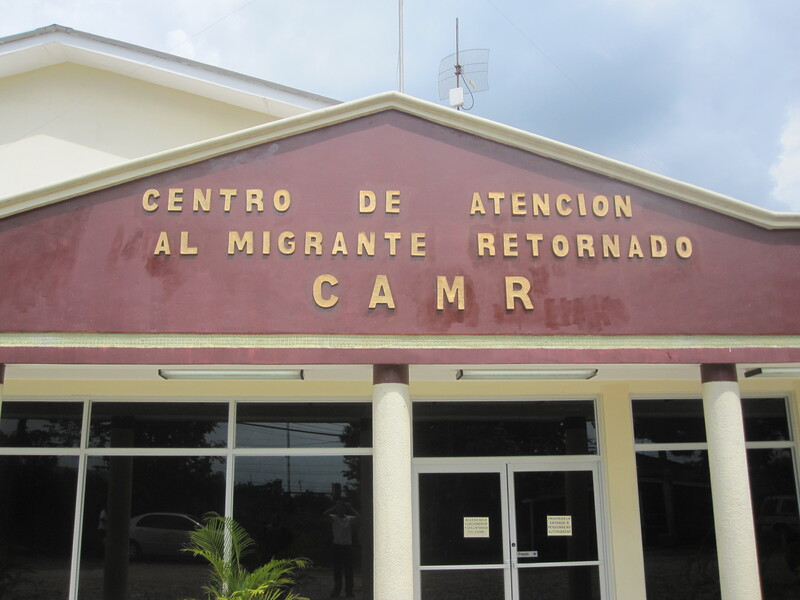 Several of the deportees were handcuffed at the U.S. detention center and remained restrained until their arrival in Honduras, even though they had no criminal record. All of the migrants were carefully guarded by U.S. marshals throughout the whole journey. “Es un autobús de lágrimas,” esa fué la expresión que un Jesuita uso para describir la deportación de indocumentados desde la frontera sur de los Estados Unidos. La experiencia rompe el corazón, pues las caras de los migrantes reflejan su frustración despues de una larga y dura travesía hacía el norte. La migración no puede reducirse simplemente a los momentos de salida de lugares de origen, tránsito por otros países y llegada a nuevos destinos. También existen los momentos, como lo vimos el jueves, cuando los migrantes retornan a sus países de origen después de haber sido deportados. Algunos de estos deportados apenas habían cruzado la frontera, pero otros habían hecho ya nuevas vidas en los Estados Unidos. Algunos de ellos habían vivido en los Estados Unidos entre ocho y dieciseis años; no sólo habían podido vivir y apoyar a sus familias, sino también habían contribuido a la economía Norteamericana. Tristemente estas vidas se esfumaron como humo, cuando el “vuelo de los sueños rotos” llegó aquí el jueves. El avión que viajo de Arizona a San pedro Sula, Honduras, retornó a un grupo de 116 hondureños, entre ellos ocho mujeres. Varios de los deportados fueron esposados desde el centro de detención en Estados Unidos y durante todo el viaje, aún cuando no tenían antecedentes penales. Todo el trayecto fueron resguardados por oficiales estadounidenses hasta su llegada a Honduras. Con poco apoyo del gobierno, la Pastoral de la Movilidad Humana en Honduras junto con otros apoyos, han establecido un centro de atención para recibir a migrantes retornados. En este centro, a su llegada, los migrantes reciben un poco de comida, atención medica (en caso de ser necesario) y un paquete de aseo personal. Fuimos testigos, de como este retorno contrasta con el ambiente festivo y familiar que se vive en las salas de llegada de los aeropuertos. El jueves, en la parte trasera del aeropuerto de San Pedro Sula, no hubo abrazos, sonrisas, globos, ni fiesta. En lugar de ello, los exhaustos migrantes se miraban tristes, descorazonados y ansiosos. Equipados temporalmente con las cosas más esenciales, ellos dejaban el centro de recepción rápidamente para ir a “casa.” Sin embargo, depues de sus experiencias, “casa” es un concepto complicado y ambiguo. Uno de los migrantes dijo: “Aquí no hay trabajos. Sólo hay pobreza y hambre. ¿Qué otra cosa podemos hacer sino tratar de nuevo de ir a los Estados Unidos?” Sin duda, muchos de estos 116 deportados pronto inciarán nuevamente la jornada hacía los Estados Unidos. Que nuestras oraciones les acompañen en el camino. 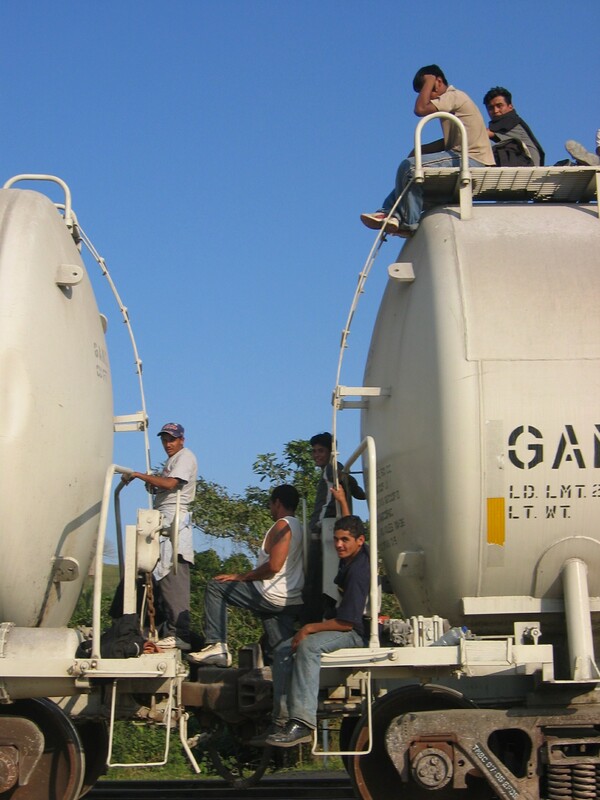 On June 14, 2012, a group of Jesuits will begin a five week journey along the “migration corridor” from Central America to the United States. The intention is not to emulate the journey of the migrants (it would be unrealistic to think that we would be able to do that), but to gain a better understanding of the reality of migration and the difficulties encountered by migrants on their journey to the U.S.
During this time we will visit shelters, human rights organizations, parishes, and different Jesuit projects that assist migrants along the migration corridor. We also hope to dialogue with migrants as we encounter them along the journey. All of this accompanied by social and theological reflection, dialogue, and analysis of potential pastoral and policy responses. We will be blogging here as much as the experience allows us to and we will do it in both English and Spanish. In the coming weeks, please keep us and all the women and men who are forced to migrate throughout the world in your prayers. El 14 de Junio del 2012, un grupo de Jesuitas iniciará una experiencia de cinco semanas a lo largo del corredor migratorio que va de Centroamérica a los Estados Unidos. La intención no es imitar o reproducir la travesía de los migrantes (sería poco realista pensar que podríamos hacer eso), sino profundizar en la comprehensión de la realidad de la migración y las dificultades encnontradas por l@s migrantes en su trayecto a los Estados Unidos . Durante estas semanas visitaremos albergues, organizaciones que defienden los derechos humanos de l@s migrantes, parroquias y diferentes proyectos Jesuitas que asisten a migrantes a lo largo del corredor migratorio. También esperamos dialogar con migrantes que encontremos a lo largo del recorrido. Todo esto acompañado de reflexión social y teológica, diálogo y análisis de posibles respuestas pastorales y políticas. Estaremos escribiendo en este blog tan seguido como la experiencia nos lo permita y lo haremos en Español e Inglés. En las siguientes semanas, por favor tenganos en sus oraciones a nosotros y a todos los hombres y mujeres que se ven forzados a migrar en todo el mundo.